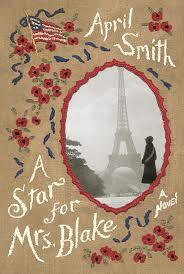 A Star for Mrs. Blake by April Smith is a fictional novel about a group of women called the Gold Star Mothers. Based on the diary of Colonel Thomas Hammond who acted as a tour guide in the early 1930’s, the book recreates a story about a fictional group of American Gold Star Mothers who travel at the expense of the U.S. government to Verdun, France to visit the graves of their sons who died and were buried there during World War I.
I truly enjoyed this book. Especially since the history of the battles fought in Verdun are described within the text. My grandfather fought in France and was in Paris on the day the Armistice Agreement was signed, so this story meant a great deal to me on a personal level. The more I read about the horrors of the War to End All Wars, the more I wonder how another World War followed. Even though I am knowledgeable about the economic reasons, it is still emotionally difficult to comprehend. The characters in the book are notable, believable, and the story well written. If you are interested in learning more about World War I and the Gold Star Mothers, I think you will like this book. It is a heartfelt reminder of the true casualties of war. This entry was posted in Uncategorized and tagged A Star for Mrs Blake, April Smith, Books, Colonel Thomas Hammond, France, Gold Star Mothers, Verdun, WWI. Bookmark the permalink.